It is said that change is the only constant in our lives. It provides us with opportunities to grow, to develop our strengths and to overcome our weaknesses. Understanding the stages of this constant in our life will help us do just that. Always be prepared for the reality of change and its inevitability. 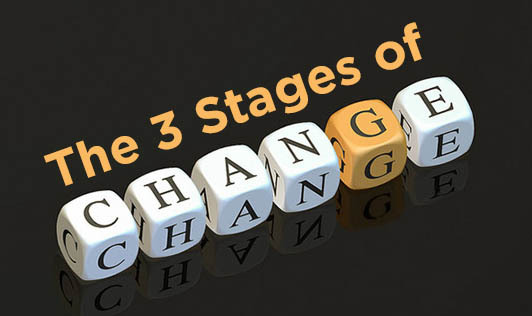 Putting in place options to cope with change before the actual process of change begins can help you to not only deal with it but potentially prosper too. Asking yourself "What's the worst that could happen?" will force you to look at the worst case scenario then work back from there. Compelling yourself to look at what could go wrong and finding strategies to avoid that scenario is the best way to prepare for change. Once the process of change has begun, give yourself time to come to terms with it. Acknowledge that there will be some amount of pain that comes with the change, depending upon the severity of the change. Ignoring or avoiding change does not make it go away. It just gets more difficult to deal with it when it actually hits you in the face. The next step is to restore balance to normal. Any change that occurs is going to cause your equilibrium to shift. Implement a determined approach to recovery and see this time as an opportunity to better your situation. List your priorities and start working on that list to restore the balance to a state of comfort. Keep at it, it will take time, but each goal that you reach, levels out the scales.